Jay D Blakeney is a pseudonym of Deborah Chester, who has also written a YA series under the name Sean Dalton. 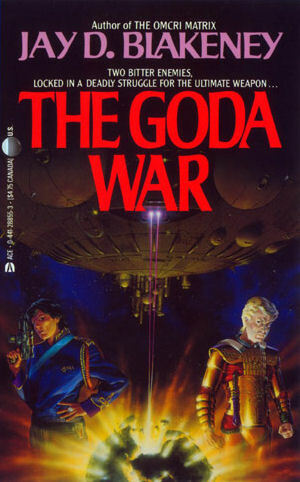 The Goda War, a space opera, is Chester’s penultimate novel as Blakeney. According to The Encyclopaedia of Science Fiction, Blakeney “seemed to be a writer to watch with some interest”, and while it’s certainly true that her Anthi novels – The Children of Anthi (1985) and Requiem for Anthi (1990) – are much under-appreciated sf novels, the same can’t be said of The Goda War. Brock is a dire-lord of the Held. This means he is the personal bodyguard of the Held’s suprin. He is a Sedkethran, a humanoid with the ability to flick (teleport) and phase in and out of dimensions. Sedkethrans also possess telepathic powers, though they are strongest with members of their own race. Brock is something of a maverick Sedkethran – the rest of his race are pacifists and dedicated to healing. Brock is a warrior, and so an outcast. The Held has been conquered by the Imish (known by the Held as the Colonids). The Held is an empire but it’s a liberal one, comprised of many races living in a tolerant society. The Imish are old-style humans, the descendants of a group who refused to accept equality with aliens and so were banished from the Held. For centuries they have been kept in place by the threat of the godas, a trio of planet-sized war machines hidden somewhere within the Held. But no more. The Imish have defeated the Held. Brock flicks himself and the suprin from the Held flagship seconds before it is destroyed, but the suprin is wounded and dying. With his last breath, the suprin makes Brock his heir and gives him the key to the godas, which is in the form of a bracelet. Later, Brock is captured by the Imish, who, it transpires, were assisted by the suprin’s traitorous heir. With the assistance of an alien, Rho, a Slathese, and another Sedkethran, Ellisne, a Healer, Brock escapes and sets off to activate one of the godas. He is chased by Colonel Kezi Falmah-Al of the Imish, the security chief of the Imish governor of the captured Held capital world. But nothing is quite as simple as it appears – Goda Primary proves to be the Sedkethrans’ home world, and activating it would strip the planet of its atmosphere and kill its entire population. Falmah-Al also hates her boss, and is determined to use the godas to further her own ends. The Goda War is as close to heartland space opera as it is possible for a story to reside. It has all the signs: an interstellar empire, which is just enough off-kilter to be alien without drifting too far from the human model; neologisms where perfectly good English words exist (e.g., suprin = emperor); magical technology – not to mention Brock’s own magical powers; an abundance of huge spaceships; and a climax in which the entire galaxy is at stake. Yet for all its adherence to the form, The Goda War manages to ring a few interesting changes. The Held is a surprisingly liberal society, and lauded as such. In fact, it is the threat of the Imish’s near-fascist society which Brock uses to compel his people to eventually overcome their pacifism. It’s not often that sf novels paint humans as the bad guys, or in such stark terms. Falmah-Al makes for a good villain, especially since she is initially sympathetic and only reveals her true colours in the last quarter of the novel. Admittedly, Brock is a typical space opera hero, anguished and possessing great privilege. And the Sedkethrans read a little too much like some super-powerful race from Star Trek, one which has deliberately limited itself through some arbitrary and easily-broken set of rules. Certain parts of The Goda War also appear to have been inspired by Frank Herbert’s Dune. At one point, Blakeney gives Brock a form of prescience, in which he sees a number of possible futures. The idea is a later dropped and mentioned only in passing near the end of the novel. The Goda War is, quite frankly, space opera mind-candy. The prose is eminently readable without actually standing out. Brock and Ellisne are little too melodramatic to really appeal as characters, though other members of the cast are better-drawn. The background is mostly identikit space opera but is enlivened by one or two good ideas. And the story-arc is neither innovative nor experimental, but comfortingly predictable. The Goda War is a novel that would make a rainy afternoon pass entertainingly, but it’s never going to win any awards and it’s never going to be remembered as anything special. It’s a shame Blakeney did not continue her career. Perhaps she would have later produced something to rival, or even exceed, her Anthi novels.